As well as the flashing light near ground level that was seen to the east, Col. Halt’s memo on the Rendlesham Forest sightings reported three starlike objects in the sky at about 10 degrees altitude, one in the south and two others in the north. The one in the south, which was the most prominent, was visible for two or three hours and was reported to beam down a stream of light from time to time. Some UFO researchers have failed to distinguish the fact that these starlike objects were quite different from the original flashing light to the east and have treated them as though they were all caused by the same highly mobile object. Here it is shown that these starlike lights have a completely separate explanation. In my original investigation, I tentatively identified these three starlike objects as real stars: first-magnitude Deneb and Vega in the north, and Sirius, the brightest star in the sky, in the south. I reached my conclusion before Col. Halt’s tape recording of events was released. That tape contains additional information about the positions of these objects which allows us to make a more secure identification. Halt’s superior officer, Col Ted Conrad, came out of his house at Woodbridge but failed to see any of the strange lights described by Halt. have seen this object supposedly hovering above them even though they went out and looked. Halt’s superior officer, Col Ted Conrad, was monitoring events by radio and came out of his house at Woodbridge along with his wife and several others. But, as he told researcher David Clarke, they failed to see any of the strange lights described by Halt either in the sky or on the ground. We do not know exactly where Col. Halt was when he taped that 4 am note, but from his patrol’s likely position either in the forest or on their way back to Bentwaters the base buildings at Woodbridge would not in fact have been due south of them but southwest. A simple planetarium computer program shows that this is indeed where Sirius was slowly setting, being at an altitude of about 7 degrees when Halt taped his note at 4 am. If Halt’s definition of north was similarly skewed, this supports the identification of Deneb and Vega, which were actually east of north. Some researchers have been unconvinced by these prosaic identifications, citing Halt’s taped description of the objects as "dancing about with coloured lights on them" (in his memo he had said they “moved rapidly in sharp, angular movements and displayed red, green and blue lights”). But of course stars twinkle many colours as their light is refracted by the atmosphere, and the effect is most noticeable when they are near the horizon, as they were in this instance. In another common effect, stars appear to move from side to side due to movements in the observer’s eye (the so-called autokinetic effect). When they are seen between scudding cloud they can appear to be moving when it is actually the cloud that is moving. Another of Halt’s descriptions, contained on tape and in his memo, is that the objects appeared as ‘half-moons turning to full circles’ seen through an 8–12 power lens (presumably zoom binoculars or a monocular), but this was evidently an optical effect as he attempted to focus the binoculars. Of course, the brilliance of objects such as Sirius causes dazzle in the eye which can give the impression of beams (as with the ‘fiery cross’ effect of Venus). But what could cause stars apparently to move towards or away from the observer? The answer is obscuration by thin, moving cloud. The resulting changes in the brightness of a star can give the false impression of approach (brightening) or recession (dimming). The length of time for which the starlike objects were viewed (several hours) reinforces the belief that they were in fact stars. “After an hour or so, I finally made the call to go in. More recently, Halt has confused the issue by claiming that there were three objects in the sky to the north, not two, and that they sent down beams into the Weapons Storage Area (WSA) at Bentwaters. 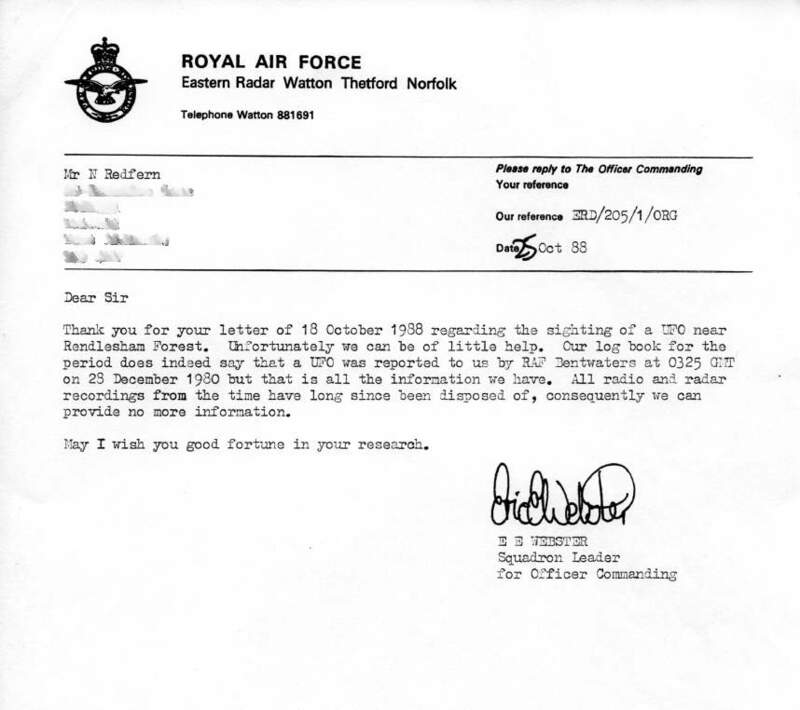 However, security policeman Tim Egercic, who was actually in the Bentwaters WSA at the time, has publicly refuted Halt’s claim that any such beams came down into the WSA. In fact, on the tape and in the memo the only object Halt describes as sending down beams is the one to the south, over Woodbridge, not the ones to the north, over Bentwaters. So this more recent claim by Halt seems to be based on faulty memory. Bobo’s account has all the hallmarks of a misidentification of twinkling stars, as outlined above. If this sounds implausible, think how less likely it is that a large, brightly lit alien craft should hover for hours over Suffolk without attracting wider attention. All eyewitness reports of the lights in the sky, including Halt’s, describe them as hovering low over the forest. No one ever claimed to see them high up. From Bentwaters they were seen towards the south, so they cannot have been the same objects that Halt saw to the north and which he claimed were over the WSA at Bentwaters. In summary, all the sightings of lights hovering in the sky are consistent with bright stars seen twinkling close to the horizon.